I’ve been blogging with varying degrees of seriousness for seven years this month. The thing is, I never set out to be a blogger as a job. 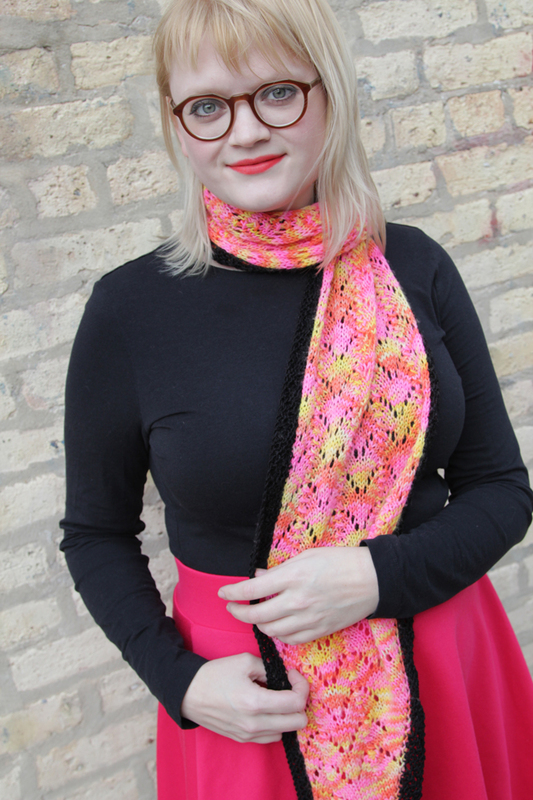 Blogging (plus evolving into a knit and crochet designer professionally) just kind of happened. I did work to get here, don’t get me wrong. In the whirlwind of my twenties, I jockeyed between two careers, a creative one (this) and a bookish one (librarianship*). What used to be, “Hey! I built a website and put pictures of various crafts on it!” is now a full time gig. The exact cocktail of what comprises my income is in a constant state of ebb and flow, but I’ve learned this year that that’s the name of the game for freelancers. I’ve got some stuff in the works for big picture plans with Hands Occupied as a blog and as a design business. This post is a solid first step toward one of my goals – being less buttoned up. Specifically I want to share more about what it’s like to be a full time yarn craft designer, teacher and blogger. So let’s do that, shall we? * But first, let’s pour one out for the one year anniversary of me leaving my full time librarian job. I wonder when it will feel like I’ve really left the profession? Before we start talking new things, I think it’s important for me to reflect on the old. Those of you who participated in last spring’s Read Along Knit Along will remember that mid-KAL, pretty much everything in my life hit the fan. (Those who participated in the spring RALKAL had updates in real time, and I do owe one especially lovely RALKALer, Judy, a huge debt of gratitude for taking over the RALKAL discussions during this time!) Brace yourself, this year was a real doozie. Six months ago, my mother-in-law suddenly passed away at age 65. She was a very kind woman, who raised three beautiful children. I am grateful to have had her in my life for almost a decade. (Though I’m trying to be more open in general starting today, I also am not her child, just the daughter-in-law, and don’t feel it’s my place to share the nitty gritty of the situation beyond the fact that it happened.) Literally while my husband and I were out of state attending her funeral, we received a call informing us that one of our dogs, Storm, had been attacked by another dog at the kennel. We were in rural Arkansas, three hours from the nearest airport, and our dog needed emergency care several states away in Chicago. To make this horrible and long story short, Storm received the care she needed at no financial cost to us. She had a broken leg, approximately 40 stitches, and a couple more gruesome issues that don’t bear discussing for the sake of the queasy reading this. Shortly thereafter, my mom fell down the stairs and suffered an arm break that required surgery and a 12 day visit to North Dakota on my part. Oh, and I was diagnosed with Hashimoto’s Disease, a bone growth was found in one of my knuckles, and I turned 30. If you’re counting, that’s one traumatic death, two serious injuries, two medical diagnoses and, although I’m not sure I could care less at this point about aging, I had a big birthday. It’s funny. When I think over what happened in the last six months, it’s so unbelievable. Having worked as a Librarian on the South Side of Chicago for several years, plus my other library work, I know that I have nothing to complain about in my life. Zero. But what I’ve learned in therapy is that all feelings are valid, and comparing crises and life situations gets a person nowhere in dealing with what they need to deal with. So, this year has been a rough spot, but it could have been worse. I’m stronger for it, and boy did I pick the right year to become a full time freelancer. My flexible schedule meant that I was able to be there for my husband, my in-laws, my dogs, and my own family in ways that were really needed. And it showed me that it’s really important and supremely meaningful to just show up with a pizza gift card and a bottle of wine if someone you know is going through something. Since all of this went down, I’ve been trying to pay forward the kind gestures that folks provided while we were having a hard time. It’s such a good feeling to know you’re putting something good into the world. When you’re completely shut down, and having a hard time even engaging with the reality that’s your own life, someone simply showing up can matter so much. 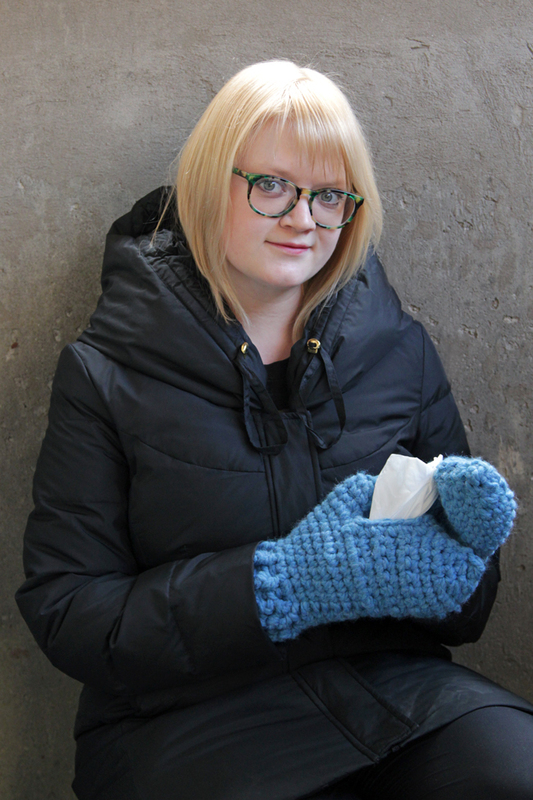 The Kleenex Share Mitts, a design project I booked for Hands Occupied in early March. You know, for having had this blog for this long, you’d think I’d have gotten up the courage to really talk about it being called Hands Occupied before now. Like many, I deal with anxiety and depression. This year has certainly illustrated that I definitely fall more toward the anxiety end of the spectrum. Based on many a conversation with others, it’s obvious that I’m not the only person in the whole world who deals with their stress by marathoning TV, podcasts & audiobooks while plowing through row after row of stitches. I knit and crochet because, for me, it’s a way to get completely lost in a story and a project. (It’s a hell of a lot healthier than drugs or alcohol too, although a little wine never paired poorly with a Knitflix session.) Some call this “getting lost” flow, which is one of the most focused states of mind one can have. Finding flow through yarn crafts is my favorite thing in the world, and I hope Hands Occupied helps some of you find your own flow with tips, tricks, patterns & tutorials. Not everyone can afford the money or time therapy requires, and getting to a flow point with yarn, for me, can be just as helpful if not more so than capital T therapy. That, folks, is what I hope Hands Occupied is able to give you. the month in which I celebrate my blogaversary (9/23/2010 – check out this uber-short post for a flashback to Hands Occupied day one!). when I remember a tragic loss in my life (that story here). the month I stopped being a Librarian (9/2/2016). Basically, It’s always a time I’m mentally prepared to take a new task by the horns and MAKE. IT. HAPPEN. It’s a new September, so it’s time for some changes to Hands Occupied. For the coming year, I want to blog a little less, but have each post mean a little more. A couple of new series are headed your way on the blog! Stay tuned for Knitflix, a series of posts dedicated to sharing some of the best binge-worthy shows especially for knitters and crocheters. Also keep those eyes peeled for more video content (I hear you, tutorial-wanters! ), and the biggest and best Read Along Knit Along yet casts on NEXT WEEK. This past year has been all about working hard, trying new things and self-reflection. Kind of a year of throwing things at the wall and seeing what sticks. I have a better sense of what’s working for my business and blog and what isn’t. I understand what I’m about as a designer, and what I like and don’t like to make. I want to continue to share clean and colorful knit and crochet projects, tutorials and inspiration, and I want to throw in other yarn crafts like macrame, weaving, latch hook, etc. as the mood strikes. On October 1, Hands Occupied is going to have a wee facelift, and the official Hands Occupied shop will launch. 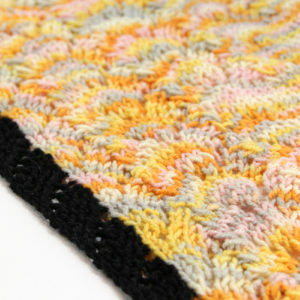 You’ll be able to sign up for workshops & get patterns right on handsoccupied.com. There will also be some giftable goodies for knitters & crocheters added in the coming months too. 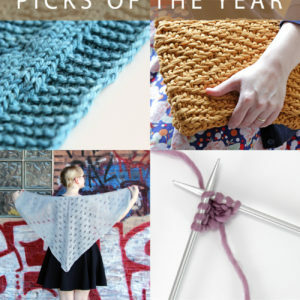 From blog content to workshops to knit and crochet kits, what would you like to see? Any requests for types of patterns, tutorials, videos, workshops, and more are welcome! Let me know your ideas and how your year has been in the comments or by emailing me at heidi @ handsoccupied.com. Test Knitters & Crocheters Needed! I sat down and opened Hands Occupied, having just removed your Sixth Degree Shawl after a wonderful walk and a beautiful sundown in the company of my husband, brother, and pooch! 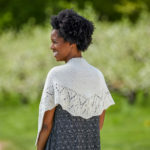 Aww – isn’t that such a fun, wearable pattern? I use it all the time myself! :) I love that quote from your family. You write beautifully! This sure has been a hard year and I am glad you are doing the right things you need to get through it. Such a lovely post. I appreciate your posts and am so excited to see where this career choice takes you. I look forward to the future posts you mentioned and more RALKALs.